A turnip is a root vegetable, which grows in places that have a temperate climate (1). The roots of the turnip are a common ingredient in vegetables, salads or other preparations. However, the leafy greens above the roots are more nutritious. They are a storehouse of antioxidants, vitamins, and minerals as compared to the roots (2). The roots of turnip are a rich source of vitamin C.
The green leaves of turnip are rich in vitamins A, C, K, calcium, and folate. They also contain a high amount of lutein(3). 100 grams of raw turnip contains 28 kcal of energy, 0.90 grams of protein, 0.10 grams of lipid fat, 6.43 grams of carbohydrate, 1.8 grams of dietary fiber, 3.80 grams of sugar. It also contains vitamins A, B-6, B12, C, D, E, thiamin, riboflavin, niacin, folate(4). What Are The Benefits Of Considering Turnips For Babies? It is best to introduce turnip for baby food when she is about six to seven months. By then you may have already introduced her to solid foods. 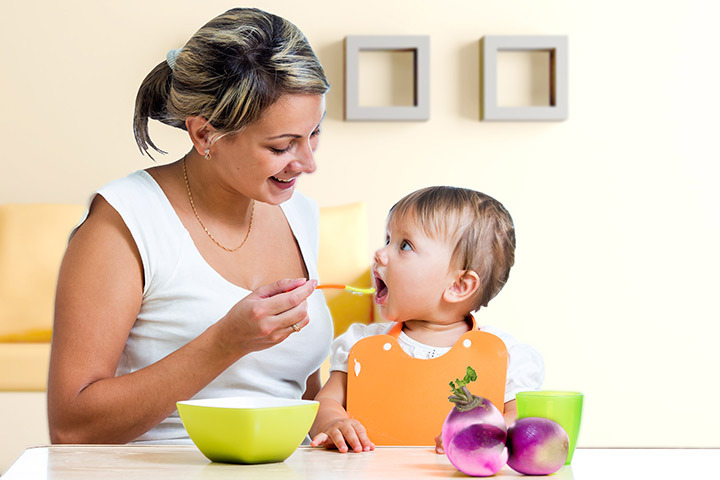 Turnips are full of vitamins and minerals that are critical for your baby’s growth and development at this age (5). The carbohydrates present in turnips will help prevent constipation or bowel discomfort in your baby. It will also ensure your baby’s digestive system is working properly(6). Vitamin C will help build and strengthen your baby’s immune system (7). It will also help your baby absorb iron from her diet. The iron present in turnips helps in your baby’s brain development. The traces of zinc present in turnip enhance the functioning of your baby’s brain and immune system. Can Turnips Cause Any Health Concerns For My Baby? Though it is not common, sometimes eating turnips can cause gas in your baby. She may suddenly cry without any apparent reason, experience discomfort in her stomach and suffer from flatulence. It is best to introduce turnips for a day or two and see how your baby reacts to it. If there is no discomfort, you can continue giving her turnips. In case she seems to get uncomfortable after eating turnips, discontinue the same and speak to her doctor. Can Turnips Cause Any Food Allergies? If you have a history of food allergies in your family, chances are your baby may be prone to it too. If you are aware of something like this, speak to your baby’s doctor before introducing turnips. If your baby has a food allergy after eating turnips, she may develop symptoms like sneezing, coughing, runny nose or itching. If you notice any of these symptoms, stop giving it right away and call the doctor. How To Introduce Turnip For Babies? Check with your doctor before you introduce turnip to your baby. Select baby turnips or the small round ones. These are sweeter than the larger ones which can sometimes be bitter. Wash the turnips, peel them and cook them in a pressure cooker with water. Once cool you can blend them into a puree or give small bites to your baby. As your baby learns to enjoy its taste, you can also add it to other baby food preparations. You may not like eating these root vegetables, but turnips are a superfood for your baby. Have a word with your doctor and introduce this healthy vegetable in your baby’s diet today.